Hello, my lovelies! It’s time for another installment of Non-Binary Authors to Read. If you’re looking to catch up on the series, you can do so here. And now that you’re all caught up, onward to new recommendations! Wen Ma is a queer, non-binary, author, editor, and translator from Hong Kong who also dabbles in illustration. 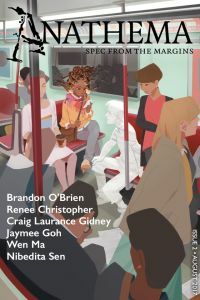 My recommended starting place for their work is Everything You Left Behind from Issue #2 of Anathema Magazine. The story takes place in a city where time is frozen. An event called the Nothing stopped it, and no one within the bubble can die or grow old. The protagonist’s lover disappears, and all they know about the disappearance for certain is that the last person to see their lover was The Pain Merchant, a man who takes hurts big and small away from people in exchange for a piece of themselves. The protagonist knows exactly what pain their lover sought to get rid of – the death of the couple’s daughter just before the Nothing froze time. Looking for answers, they seek out the Pain Merchant themself, and make an odd request – they want to take their lover’s pain rather than pain of their own taken away. A trade is agreed upon, and they drink the pain their lover gave up. But this isn’t my pain, isn’t my grief. It’s yours, at once alien and achingly familiar. I’m drowning in it, trying to keep my head above the waves even as the storm threatens to pull me under. By consuming it, the protagonist comes to understand the rift between them and their lover, the doubt and guilt their lover felt, the questions they couldn’t stop asking. If they’d never adopted Fara, if they’d lived somewhere else, would things be different? They see how their lover came to resent them in a way for processing grief differently, and come to understand why they left. It’s a lovely story, beautifully written, and despite the subject matter, it’s not without hope. While it is a story about grief, it’s also a story about finding a way through grief, and learning to see the world through someone else’s eyes. The story meditates on loss, family, and the fundamental isolation of humans. No matter how well we know someone, we can never see and feel and experience the world exactly as they do. This is echoed in the story by the unchanging nature of the city, cut off from the world, and bringing into question what the point of anything is in a world without time. However in this story, the protagonist is given the rare opportunity to understand at least one aspect of their lover completely, and that brings hope. It’s a gorgeous story and an excellent starting place for Wen Ma’s work. Latonya Pennington is a queer essayist who regularly contributes to Black Girl Nerds, The Mary Sue, Beyond Words, and BuzzFeed. My recommended starting place for her work is actually two essays, which I see as being thematically linked – What Magical Girls Taught Me About Being Queer, and When Will Black Coming-of-Age Films Leave the Hood. The first article is more personal, discussing how Sailor Moon helped the author realize her queerness, and deal with coming out to her friends and family. The second article is more general, questioning the way many black coming-of-age movies follow the pattern of Boyz n The Hood rather than presenting a wider range of black, teenage experiences. Although their subject matter differs, similar themes resonate across both articles. Both pieces underline the critical importance of representation, and being able to find yourself in fiction and film. They also highlight the importance of portraying a diversity of experiences. Growing up black is not a monolithic experience, nor is being female, queer, disabled, etc. Marginalized voices are already erased and dismissed, and presenting only one model of femininity, queerness, blackness, or anything else, only further erases individuals. It’s othering and alienating. Both articles also make the point that the more representation there is out there, the more likely we are to see ourselves reflected on the page and on the screen, and that can literally be a life changing and/or a life saving experience. They’re both excellent articles and a worthy starting place for Pennington’s work. T.X. Watson is an author, activist, and the co-founder of Solarpunk Press, a short fiction magazine celebrating the solarpunk sub-genre. 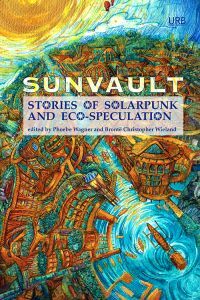 Appropriately enough, my recommended starting place for their work is the opening story from the anthology Sunvault: Stories of Solarpunk and Eco-Speculation. The Boston Hearth Project is written as an admissions essay from a prospective student, Andie Freeman, who is applying to X.S.U. The question in particular zie is answering is “When have you worked well as part of a team?” The answer may be slightly illegal, but after being assured that application essays are confidential, zie relates the story of working with a team of activists to take over a first class hotel and turn it into a homeless shelter. Andie is an e-sports expert, and takes on almost Oracle-like role on the team, guiding Juniper, an urban explorer and parkour practioner, through the building – avoiding guards, and security cameras – in order to stage the takeover. Practicing with AugR was like learning to operate another body. I learned new limits for what was physically possible. I know how far back Jupiter’s arms can go before they hurt, and how much farther before they’ll keep hurting afterward. I know how high she can jump. I know how soft she can land. One of the defining characteristics of solarpunk is its hopeful nature. It imagines a better future, one that embraces diversity, and where people work together toward the greater good. Andie’s team can be seen as a kind of future version of Robin Hood and his merry men, robbing from the rich to give to the poor, and making innovative use of technology to do so. The structure of the story is clever, opening with an email exchange between Andie and an X.S.U. admissions counselor before going in to the essay. Because it’s written as a personal essay, the story doesn’t lose any immediacy, so Watson remains free to show us the friendship between Andie and zier team, along with the tense action of the break in and occupation itself. In a time when it’s all too easy to imagine a grim future where corporations and profit are valued over individual people, and hate-speech is given free rein, The Boston Hearth Project offers hope. It is a story of camaraderie, resistance, and working for a greater good, all of which make it an excellent, and timely, starting place for T.X. Watson’s work. As always, please leave your own recommendations for non-binary authors to read in the comments, and I’ll be back with more recommendations soon! You’re welcome! I hope you enjoy the works.